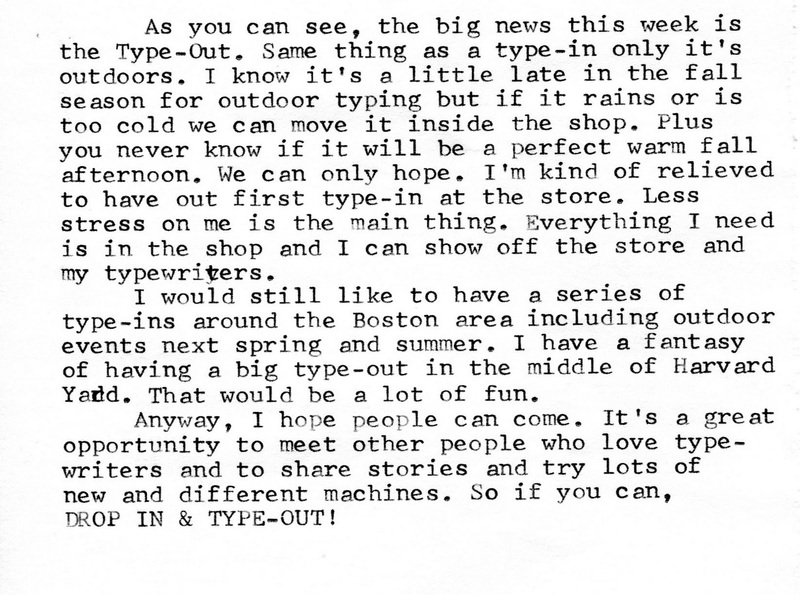 Life in a Typewriter Shop: The BOSTON TYPE-OUT is Coming! The BOSTON TYPE-OUT is Coming! I've seen this machine in two different TV shows this year. Someone just bought this Streamliner as a gift. This pink Olympia SM-7 sold a few days ago. We nicknamed it Pepto. You might try using a different browser to try to post replies. Sounds good to me too. Now I want to arrange another one here, maybe finally get around to that Olympia shindig. I am mad! I am visiting Boston from San Francisco only one week later and I will miss this fabulous event! Have fun with it. 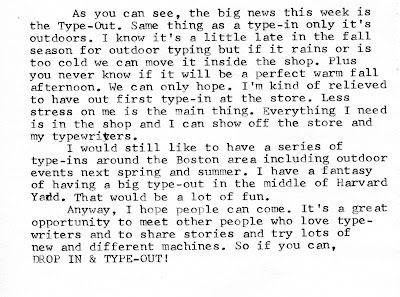 We just had a Snail Mail Social here in SF on Saturday with loads of typewriters - I posted some photos on my blog (CappuccinoandArtJournal.blogspot.com). 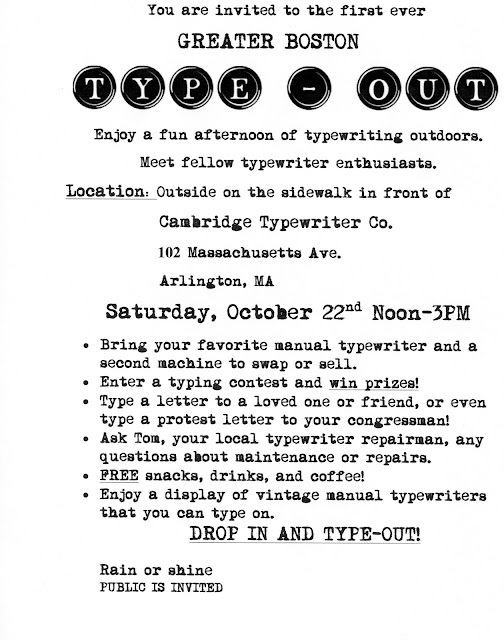 I want to stop by the shop when I"m in town -- my wondering Royal typewriter is from you. Keep typing -- and sending mail. Very nice machines. The pink Olympia is... special. I think you need to check your "settings" for your account. There is a new setting there for replys to comments. I had the same problem when they updated their interface. I will try to call you tomorrow. Very excited for this! I'm planning on stopping by! - will you be interviewed? A new, and very pleased/impressed reader. Will visit often. 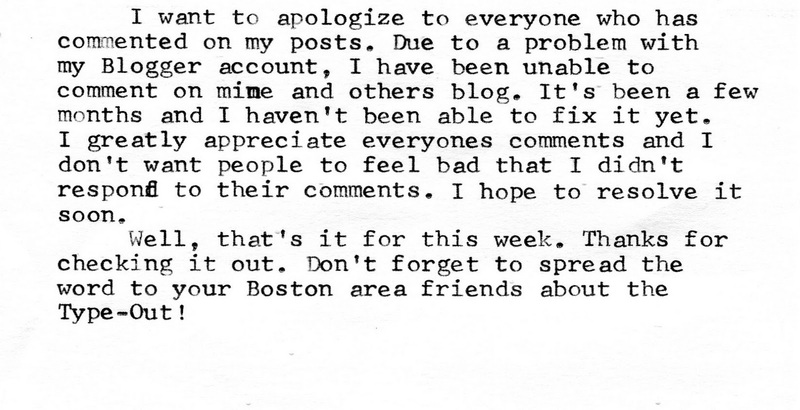 so sorry I missed it! You should do it again! and did you see this pic on the BPL flicker page? Love that Royal! It's the Futura 800 isn't it? 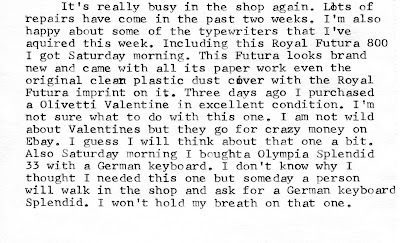 It has a unique typeface and I think your current tlog was typed with it. 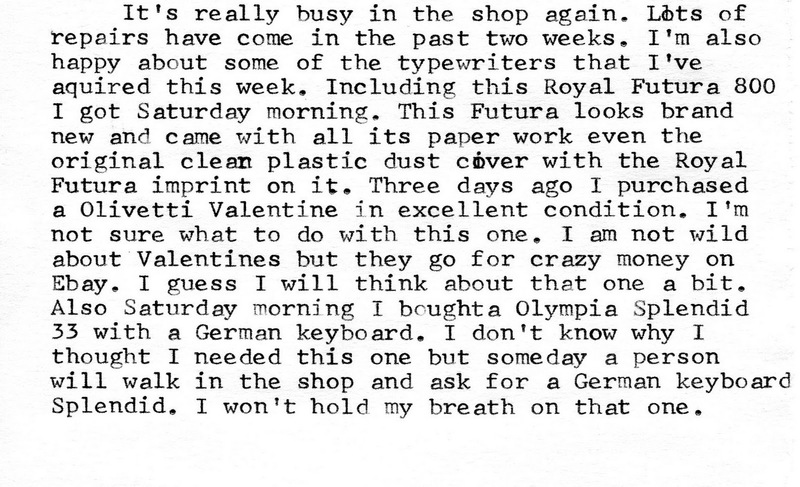 Martin- Yes that was a Futura 800. I love the typeface on it too. I did typecast with it. 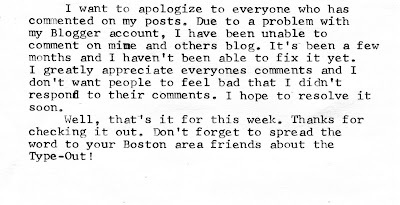 Yeah, I can comment again. thanks for the tip Richard. Pamela, I hope you can stop by when you are in town. It would be great to meet you.